People who live in Virginia truly get to experience four distinct seasons, and in autumn, that means we get to enjoy a majestic display of color from the changing (and then falling) leaves: as green leaves turn to gold, amber, brown, orange, red, purple, and colors in between, we are treated to a beautiful display before the trees go bare. A question we sometimes get around this time of year, especially from folks new to the area, is what are the best spots to see trees in their many colors or, in other words, to go “leaf peeping.” Chances are that if you are out and about walking through your neighborhood, enjoying a local park, having fun at a fall festival, or enjoying an outdoor community festival, you will already be doing some leaf-peeping (the photo below, in fact, was taken by my son. But if you want to make a special trip to a place where the variety of trees will give you a greater show of colors, here are some ideas. 1. SKYLINE DRIVE: You must, at least once in your lifetime, take a leaf-peeping drive through Skyline Drive in Shenandoah National Park, just a little over an hour west of Fairfax County. This park in the Blue Ridge Mountains is “the quintessential fall foliage destination for Southeastern travelers, and Skyline Drive has been called one of the top 10 scenic mountain drives” in the United Stated, notes Travel + Leisure magazine. Yes, this means it can — and does — get crowded, so if the idea of being in stuck in “traffic” in the mountains is not appealing, plan your trip carefully (keeping track of the foliage forecast through the links above). 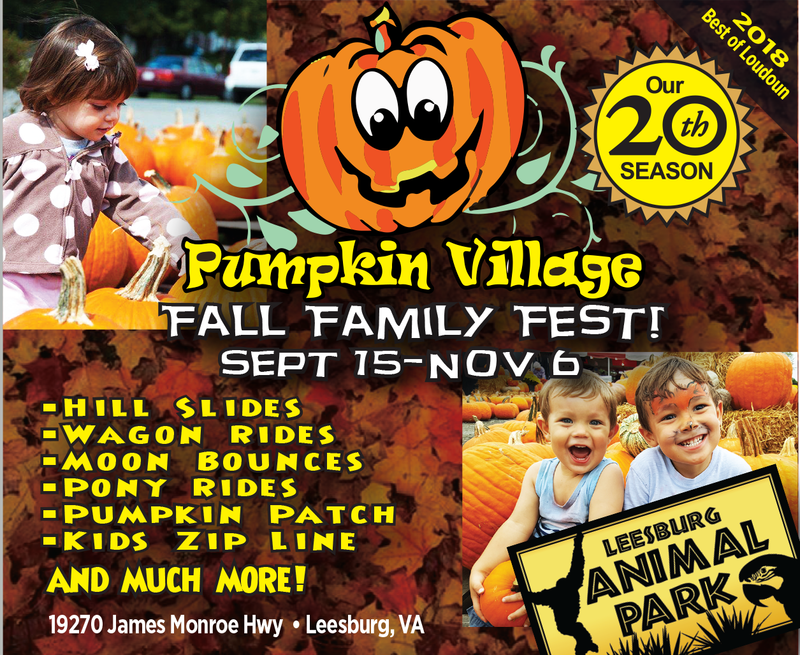 You may even want to make it a weekend of it: The Virginia tourism office has a suggested 3-day leaf-peeping itinerary. 2. PRINCE WILLIAM FOREST PARK: Heading south instead of west, consider Prince William Forest Park, located less than 30 miles south of Fairfax, in Triangle, VA. This national park is the largest natural protected area in the Washington, D.C. metropolitan region and has more than 19,000 acres and 37 miles of hiking trails. Its abundance and variety of trees means you’ll have plenty of colorful leaves to see. 3. LOCAL PARKS: Staying closer to home, check out the many parks offered by the national and state park systems, Fairfax County, and area municipalities. You may not get quite the vistas you’ll get from up in the mountains at Skyline, but if what you want to see are the colorful leaves, you really don’t need to drive far. See our parks page for links to all the park systems in our area. Some especially good ones would be Burke Lake Park (it’s huge and surrounds a lake), Riverbend Park in Great Falls (along the Potomac River), and Great Falls National Park (the rapids and waterfalls are a bonus). 4. MOUNT VERNON: Heading soon to George Washington’s Mount Vernon Estate just south of Alexandria? Time your visit right and you can enjoy the fall foliage there! This historic home sits on 500 acres facing the Potomac River and has beautiful grounds and gardens (the photo at the top of this section, in fact, was taken by my son, then age 7, on a trip to Mount Vernon last fall). The estate is hosting several events in the fall. 5. GEORGE MASON UNIVERSITY (GMU): One of my personal favorites for its location and easy access: the GMU campus in Fairfax. This campus of the largest university in Virginia sits on 677 acres and is surrounded by trees. I attended graduate school there and my consolation for the long walks there from the parking lot (after a long day of work) to class was the beauty that surrounded me, especially in the fall. If all you’re looking for is to see colorful leaves (and take great family pictures) it can be as easy as going to a GMU parking lot on a weekend! But if you want something a little more scenic for your photo opp (or a picnic), head to the Mason Pond, which has a fountain, a large grassy area, and benches. There’s a public parking garage on campus just a short walk away. 6. FOLIAGE BOAT TOURS: Not up for a drive or a hike? You also can leaf-peep on a boat! Fairfax County Park Authority each year offers one-hour fall foliage boat tours at Burke Lake Park (see the link for details). Guests will ride a pontoon boat around Burke Lake and enjoy a hot beverage; tickets are $6 per person. Many of the touring companies in Washington, DC also offer fall leaf-peeping cruises on the Potomac River — see our Family Fun Deals page, where you can usually find discounts on these types of cruises! 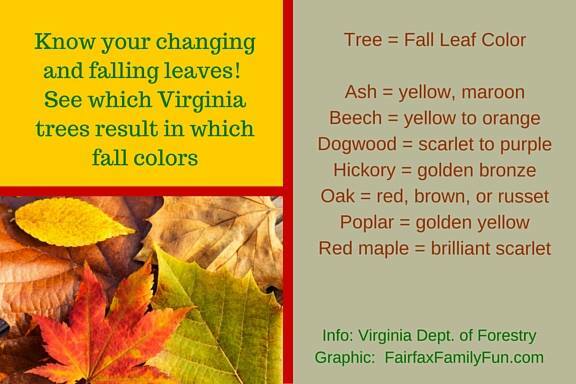 By the way, do you know how to tell what leaves come from which trees, based just on the color? This list below can help you identify them (it also is handy for teaching kids during nature walks). Readers: do you have any leaf-peeping spots to share with others locally or close by? Let us know by leaving a comment below and we’ll add them to our list! Share the post "Leaf Peeping"